The altarpiece of this altar represents St. Benedict of Norcia (kneeling at the foot of the Madonna) and his young disciple S. Mauro. This work is a copy of a good work by Domenico Zampieri (1581-1641), known as Domenichino. Today (2014), Giovanni Romano attributes it to Raymond Levieux, a Provencal painter of the mid-seventeenth century. The original was (before it was stolen) in the Parish Church of Garlenda, a village in the hinterland of Albenga. This copy must have succeeded so well that we are talking about taking it as a model to redo a painting to replaces the stolen one. And that is, You are the glory, the joy and the honor of Our Benedictine Congregation. 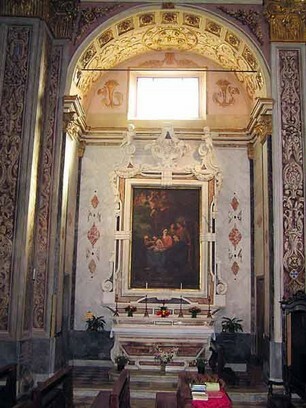 NOTE: This chapel was formerly dedicated to B. Bernardo Tolomei. In 1880 (XIV centenary of the birth of St. Benedict) Fr. D. Urbano Bartolomeo Gerini (Benedictine monk, parish priest since 1870) had it restored at the expense of the Order and dedicated it to St. Benedict.